The Zinnia Patch: hello, june. We had such a fun and full long weekend. 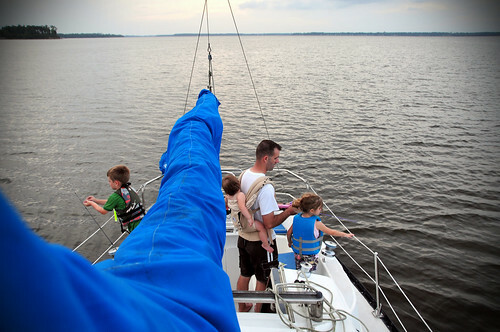 We took the kids to their first baseball game in Kinston, did some shopping in Wilmington, ate shrimp in Surf City, and sailed around the New River inlet. Today I'm having trouble remembering where I am, what day it is and what I should be doing. It's only because of Christy's help with the kids and her amazing homemade iced coffee that we all made it to nap time. I'm sitting at my little workspace now listening to The Voyage of the Dawn Treader coming from my son's room and the thunder outside and attempting to face the reality of June. I have so many photos to catch up on, new software to install, old photos to back-up...oh right and a house to clean and eight loads of weekend laundry to put away and three kids to mother and this little thing called a PCS looming entirely too close for comfort (that's Permanent Change of Station -the military likes to make everything sound complicated and dramatic). There's more. We're traveling to Arizona for a wedding and family reunion (oh the pictures! I think my hard drive just groaned out loud). We're attending a three-day Classical Conversations practicum. We're enjoying a garden full of flowers and making last trips to the beach and spending time with such dear friends...oh help. I can't even begin to face that one. Not with dry eyes, anyway. Who would I talk to about requesting a few extra days being added to this month's calendar? Better yet, could I just add my neighbors to the packing list along with one very large and beautiful hydrangea that I can't possibly leave behind...? Oh, June. You're going to be a tough one aren't you? Oh my goodness -- so much going on. Thinking of you and wishing you a smooth transition and happy (incredibly busy) June. Here's to a month filled with playdates, iced coffees and lots of denial. Now, what is that huge lump in my throat from? Wow, that is one busy June. I wish I was there to help you out and maybe take something off your plate. Saying goodbye is so hard, especially to people you have grown to love. But you never know when your paths may cross again. Isn't life incredibly interesting that way? I hope the days stretch out beautifully before you, especially during the playdates and special times with dear friends. 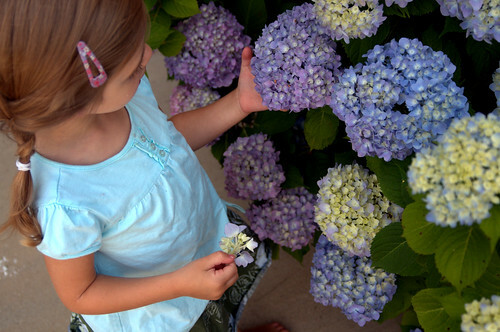 For what it's worth, I think I would try to dig up and pot the hydrangea. It is absolutely stunning this year!!! With all the busyness of your month, I hope you're able to stop and enjoy the time with your friends and family! I'd dig up the plant, too. When my parents moved, my mom took half her yard with her. Same with my mother-in-law. So you finally made it to an Indians game, right before leaving?! That sounds like such fun- we really miss them! In between all the busy stuff- don't forget to enjoy your days!